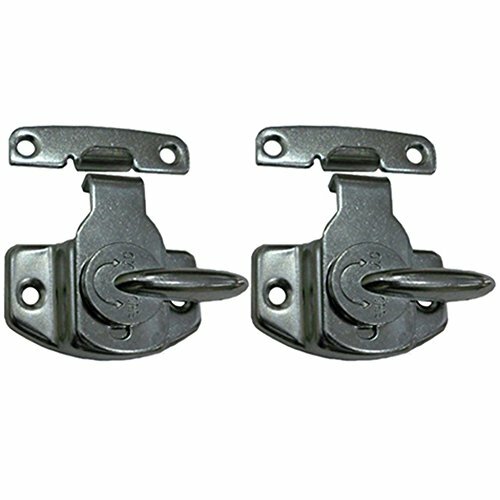 The connectors come two to a set and latch one table of any length to another. They mount easily to the underside of any table with just a few screws. Dual purpose lever lock and striker hardware is perfect for locking both table leaves and table halves, ensuring quick and easy table setups. Applicable to table, wooden case, cabinets, drawers, cupboards and other furniture. Made of high quality iron, durable. Keeps training tables from drifting apart and maintains a neat and orderly look. Best for tables that have alignment pins. Lock and unlock tables in an orderly fashion with a sturdy latch and handle design. Size: 2.56x2.28 inches(6.5*5.8cm); screw height: 0.63 inch(16mm), screw diameter: 0.16 inch(4mm). If you have any questions about this product by Echaprey, contact us by completing and submitting the form below. If you are looking for a specif part number, please include it with your message.